Won't you come out we can paint the town red. Kill a little time you can sleep when you are dead. Chase a couple hearts we could leave em in shreds. 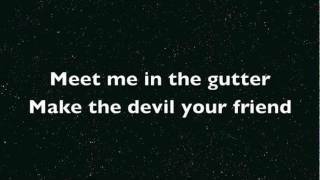 Meet me in the gutter make the devil your friend. Just remember what I said, cause it isn't over yet. holding my breath til my body turned blue. We got everything to lose, yeah I'm waiting on you. You got everything to lose, yeah I'm waiting on you. To where the lonely ones roam. Get lost in the dark to find yourself. no it isn't over yet.